We’d love your help. 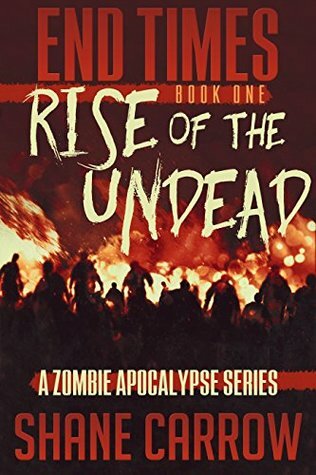 Let us know what’s wrong with this preview of Rise of the Undead by Shane Carrow. New Year's Day: midsummer in Australia. In Perth, twin brothers Aaron and Matt have graduated high school and are enjoying their last few months of summer holidays before adulthood - while on the other side of the country, something has fallen from the sky, heralding the dawn of a new age. As a terrifying plague spreads across Australia and the world, Aaron and Matt find t New Year's Day: midsummer in Australia. In Perth, twin brothers Aaron and Matt have graduated high school and are enjoying their last few months of summer holidays before adulthood - while on the other side of the country, something has fallen from the sky, heralding the dawn of a new age. To ask other readers questions about Rise of the Undead, please sign up. Would have been a 3*, but the overly melodramatic, pat ending took away most of my good will. Anyway. She did seem pleased to hear from me, although she called me out straight away on the fact that Dad had put me up to it. Great book with an astonishing conclusion, honestly I really enjoyed this book from beginning to end. The journal entry method of telling the story really makes the atmosphere personal, and every tragedy is heightened because of it! Can't wait to read the second book. Fantastic. Phenomenal. Jam packed with adventure, zombies, military action, emotion, love (not the romantic kind), suspense, mystery, the right amount of science fiction, wide array of interesting and balanced characters and relationships - overall it has become one of my top favorite series. And not just because I love it intellectually like I usually do with other series or books, or because of the excitement it offers. Although those experiences are there. I love it because it captured my heart. Now, don’t shy away because I said that. This is no mushy-gushy tale BY FAR. It’s the realistic manner in which the bond between the twin brothers is spun, as well as all the other relationships in the story. It comes across as completely authentic. Therefore, translating to quite meaningful. I think reading the six books as a set engenders this as well. There are no stop gaps. I’m a huge reader, most especially in the military zombie apocalypse genre. Generally 3-5 books per week, and the blood, sweat, and tears apocalyptic struggle is alive in this story. From start to finish I had to cheer on the main characters as they experienced trail after more difficult trial. The military presence was right in the forefront; a defining aspect of the book. And the zombies. Nothing too exceptionally unique here. Except how they .... well, I’ll let you find out. ;) It’s interesting. Character development is masterful. Scene setting, also masterfully crafted. As the characters you come to know so well move through their days and nights, you are right there with them. Feeling the dry air, the maddening thirst, hearing the gravel underfoot, seeing the ship so clearly out off your beach, out on the ocean, smelling the salty air - or the rotting corpses, feeling your anxiety rise and your own adrenaline pop up a bit as a favorite character is being hunted....and a hunter is so, so close as you hide just below him in a rock nook. And more. It’s superbly created! And wildly fun to experience. There are a few editing errors that do stand out, but are easily forgiven as the entirety of the story is so great. Such as a Major being referred to as a Captain a month later. *shrug* Forgivable. Overall, this is not a series to be missed. I wasn’t sure what to expect going into it. Still wasn’t sure 7 days in, even though I really I liked it (it’s in a journal format - wasn’t sure about that either). But by the 15 day mark, or maybe even before, I’m not looking back, sorry, I was DEFINITELY not leaving Aaron and Matt’s side for anything. I was INVESTED. Then the story just kept getting better and better. Richer, and deeper. The journal format, which I usually dislike, was the ideal way to tell this story. It was perfect. I can’t believe I just said something about ANY book that was “perfect” - but it’s true. Thus, with that, I’ll just say —- don’t miss out on this one. The story is told as Aaron's journal. When the story starts, his biggest concern is getting into college next year. That all changes when a virus starts breaking out...and zombie apocalypse stuff happens. The writing was pretty good and the kids were likable. Well, Aaron was likable. Sometimes Matt was a little scary. I liked how they had really rotten luck and seemed to mostly survive by luck. This apocalyptic nightmare strikes me as a much more likely scenario if (when) the true apocalypse arrives. I want to believe that most humans are good but, I fear, that would not be true if most were faced with their families starving. I enjoyed reading it and was well invested in the main protagonists journey. There are lots of twists and a few surprises. There are a few grammatical errors but not so much that they pulled me out of the story. There is also quite a bit of cursing, as a heads up This apocalyptic nightmare strikes me as a much more likely scenario if (when) the true apocalypse arrives. I want to believe that most humans are good but, I fear, that would not be true if most were faced with their families starving. I enjoyed reading it and was well invested in the main protagonists journey. There are lots of twists and a few surprises. There are a few grammatical errors but not so much that they pulled me out of the story. There is also quite a bit of cursing, as a heads up to those that prefer to avoid bad language. I had a hard time putting this book down. The characters were relatable and seemed like real people. The plot was easy to follow with a few twists and turns to keep you off guard. The harsh reality of how people would probably treat each other is definitely covered and had me dismayed a few times. I thoroughly enjoyed the journal style that this author used. Definitely reading book 2! I've watched a lot of The Walking Dead and Fear The Walking Dead and I do have to tell you that rise of the undead was pretty good. I can't wait to read the next book in the series I really enjoyed the adventures that Matt and Aaron had to deal with and I wish the boys well just sorry that it was Aaron that killed his dad and not even realize that that's who he shot. I'm really not sure how to rate or review this one. I was going to go low because I couldn't find much likable about the main characters. But the ending; I'm still kind of blown away and still processing it. Twin brothers have to grow up fast and think for themselves. Story held my interest. Look forward to the next book. One of the best written zombie books out there. Characters and setting are realistic and fun to read. I already bought the second book! I don't usually like first person stories, but this one was pretty good. The atmosphere was very real. A great read. I really liked the book but the ending was sad. I can understand how Aaron felt after the situation with his dad but I didn't think he would just give up. I must say I found this read thoroughly engaging, I found myself lounging to read, even reading while I prepared meals! The characters are well thought out and it had just the right amount of blood and gore to satisfy my darker side. Read it! You just might learn a thing or two to boot! Matt gestured out at the city – the dead roaming the streets, the river silent and empty of evacuation boats, even the fighter jets gone from the sky now. Nothing but silence and death. “We’ll be okay,” I said.